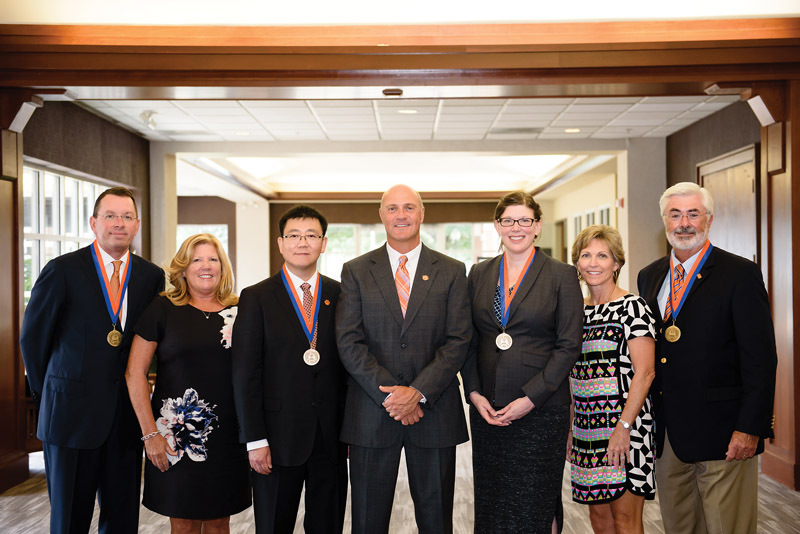 Professors Amy Landis and Hai Yao were honored as endowed chairs this past fall in a ceremony where they received endowed chair medallions. Landis, a nationally respected researcher who came to Clemson in 2015 from Arizona State University, is the Thomas F. Hash SmartState Endowed Chair in Sustainable Development. She coordinates the SmartState Center of Economic Excellence in Sustainable Development, whose researchers are developing technology to collect massive amounts of data that can be deployed to measure everything from water quality in rivers to traffic flow on highways. They hope the data will give policymakers the information they need to manage development sustainably as a growing population and climate change make the task more difficult. Landis’ hiring was made possible through a $2 million gift from Thomas F. Hash ’69 and matching contribution from the SmartState program, which provides dollar-for-dollar state funding through the S.C. Education Lottery. Hash graduated from Clemson with a degree in mechanical engineering and served as president of Bechtel Systems and Infrastructure before retiring. Yao, who oversees the Clemson-MUSC Bioengineering Program, is the new Ernest R. Norville Endowed Chair in Biomedical Engineering, based at the Medical University of South Carolina in Charleston. An expert in disorders of the jaw’s temporomandibular joint, commonly known as TMJ, Yao and his team create computer models that predict dynamic changes within the jaw, helping answer critical questions about its pathophysiology for developing new diagnosis and treatment strategies. He also heads up the South Carolina Translational Research Improving Musculoskeletal Health, or SC-TRIMH, which brings together Clemson and MUSC researchers with Greenville Health System clinicians to create models for virtual clinical trials. The Ernest R. Norville Chair is the result of a $1.5 million gift from Mitch and Carla Norville. Mitch Norville received a bachelor’s degree in mechanical engineering in 1980, and the endowed chair is named after his father. Mitch Norville retired as chief operating officer of Boston Properties and is the owner of Atlantic South Development Inc.